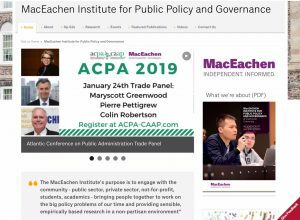 The MacEachen Institute for Public Policy and Governance at Dalhousie University is a nationally focused, non-partisan, interdisciplinary institute designed to support the development of progressive public policy and to encourage greater citizen engagement. The Institute is supported by three faculties at Dalhousie University: Faculty of Law, Faculty of Arts and Social Sciences, and Faculty of Management. 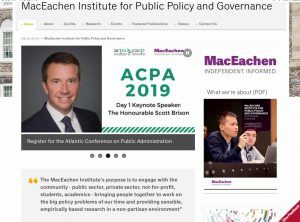 We invite you to listen to Dr. Kevin Quigley’s “welcome video” which highlights the vision and mission of the MacEachen Institute for Public Policy and Governance. 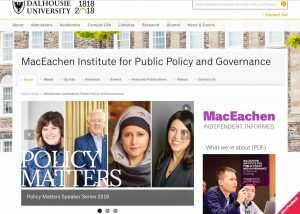 Policy Matters is a weekly panel discussion on major policy issues presented by the MacEachen Institute. 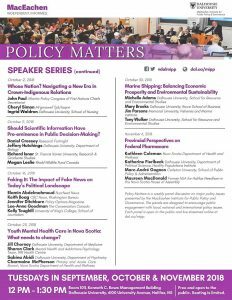 These robust dialogues speak to a wide range of topics from the impact of fake news to Provincial perspectives on Federal Pharmacare. 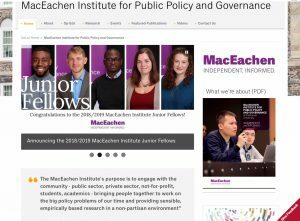 We encourage you to subscribe to the MacEachen Institute’s mailing list to receive invitations, activities and updates.